There had been much anticipation about Apple's predicted foray into the TV streaming market, dominated by the likes of Amazon and Netflix. 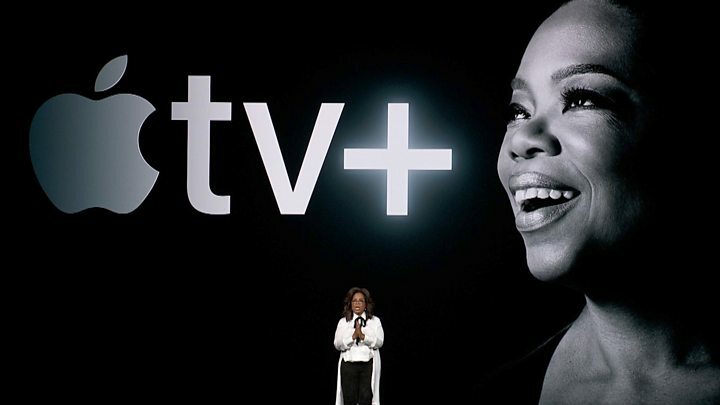 "The test for Apple will be, can new content separate them out from their competitors and can they commission and deliver on fresh new content that can reach audiences in the same way that Stranger Things has for Netflix for example?" commented Dr Ed Braman, an expert in film and production at the University of York. A new games platform, Apple Arcade, will offer over 100 exclusive games from the app store which will all be playable offline, in contrast with Google's recently announced streaming platform Stadia. in 2018 analyst firm IHS Markit valued the global gaming market on iOS, Apple's operating system, at $33.5bn. "Apple's decision to move up the games value chain with a new, curated subscription service and to support the development of exclusive games for its Arcade platform is a significant escalation of the company's commitment to the games market," he said. "Apple joins the other technology companies Microsoft, Facebook, Google, Amazon and others in investing directly in games content and services." A bigger test will be how creative those ideas will be - a lot of Netflix's success has been about finding new talent, not throwing money at already famous names. I also have reservations about how many boundaries Apple will be prepared to push with its creative endeavours: if it's as controlling with its television as it is with its brand, it will create a catalogue bereft of risk-taking. But TV is just a small part of what Apple is going for here. It wants (and needs) to turn its devices into the portal through which you do everything else - TV/film, gaming, reading the news... and you'd presume other things in the very near future. As Oprah put it on stage: "They're in a billion pockets, y'all."